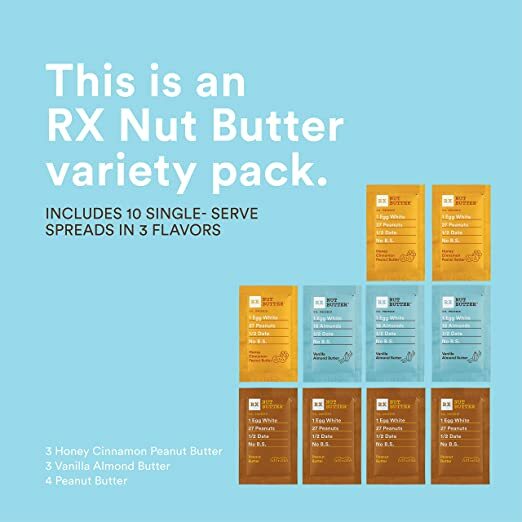 Amazon is now offering the RX Nut Butter Variety Pack 10-Count for $10.25 with free shipping for Prime members. I am not really a fan of this brand’s bars, but I love just eating this nut butter out of the packet! Why not give a try, it is just $10! RX Nut Butter is the nut butter that’s more than nuts. Combining tasty, high-value ingredients (like egg whites, dates, and nuts) in a smooth, satisfying texture, this snack contains 9g of protein and tastes delicious. What you see is what you eat. One look at our wrapper and you can see what we’re all about.